Vaccinations can help your baby have a healthy start in life. When your baby gets on-time vaccinations, he gets protection from serious diseases. Most babies can follow the vaccination schedule from the Centers for Disease Control and Prevention (also called CDC). Ask your baby’s provider if this schedule is right for your baby. If your baby has a health condition, travels outside the U.S. or has contact with someone who has a disease, she may need a different schedule. Because vaccines protect against diseases that aren’t common anymore, you may wonder why you need to vaccinate your baby. These diseases aren’t common in this country, but they still exist. For example, many cases of whooping cough and measles have occurred in the United States over the past few years. You can help protect your baby from serious diseases and their complications by making sure your baby gets all the vaccinations he needs. Follow our vaccination schedule based on the CDC recommendations. Vaccines help protect your baby from harmful diseases and help prevent him from spreading diseases to others. In the first 2 years of life, your baby gets several vaccines to protect her from 14 diseases, including whooping cough (also called pertussis) and measles. Babies 6 months and older need the flu shot every season. Your baby gets two flu shots in his first year of life. He then gets one shot each year after. 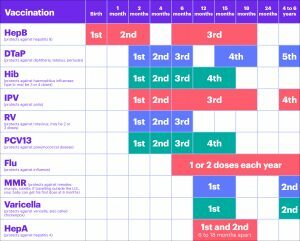 Vaccines help your baby develop immunity. Immunity is protection from disease. Vaccines are very safe. They are carefully tested and checked by scientists and healthcare professionals before anyone can get them. Getting more than one shot at a time won’t harm your baby. Even as a newborn, your baby’s immune system can handle many shots at once. All babies, including babies who spend time in the newborn intensive care unit (also called NICU), need vaccinations. Most premature and low-birthweight babies follow the same CDC vaccination schedule.